"Towson University's Britt Woodfield, Hillary Fratzke and Meggie McNamara, left to right, now in their third season, have been fixtures in the starting lineup since their freshman year. They will be relied upon heavily to carry the heavy load of postseason aspirations when the Tigers' season begins on Saturday." It's my favorite time of the year: Lacrosse season. If I could only watch one sport for the rest of my life, it would be lacrosse. There is nothing like it in the world. I grew up playing "the fastest game on two feet" since I was five-years-old and played my final game my freshmen year of college. Although I enjoyed playing the game my entire life, I knew I'd rather be shooting photos and working on building a career, so I left it in my past. However, each year I miss it so much as I shoot an NCAA game each weekend. With the season starting a week from tomorrow, I've been shooting a lot of portraits for The Towerlight spring preview. 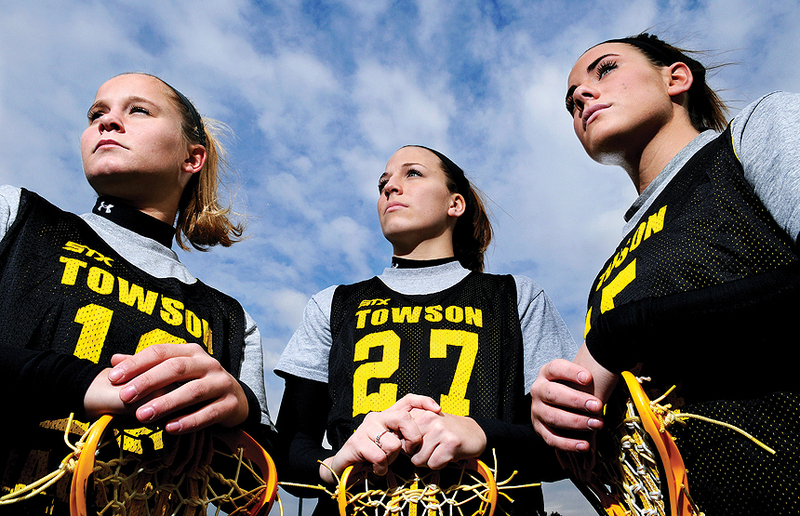 This afternoon, I shot Towson University junior women lax players Britt Woodfield, Hillary Fratzke and Meggie McNamara. The three have been fixtures in the starting lineup since their freshman year and will be relied upon heavily to carry the heavy load of postseason aspirations. The new sports editor gave me very little notice about all the portraits he needed for the special section, so I wasn't given much time to produce ideas. I originally planned to keep all the portraits similar with a theme, but with the small margin of time to complete the shots, I was forced to change my plans. For the above, I showed up 30 minutes before the three girls had to go to practice. Although filled with smiles, the girls insisted to be "all business." It was a fairly simple portrait and I relied on my lighting to make them pop a little bit more than I usually do with lit portraits. The day was overcast, but just as we were wrapping up, the bright sun and a glimpse of blue in the sky peered out from the cloudy skies. It was just enough time to shoot a couple more frames and get a little more color to the image. "The Big Three" as referred to by the sports desk, seemed to like the image. For being standard, I like the image, too. If you end up shooting Nick Williams tell him I said "What's up" I don't know if he graduated yet, but we grew up together playing in TRC. Williams either graduated or is out of eligibility for lacrosse. I am not sure which.